Thursdays are family night at Sky Zone Space Coast. Come on out for dinner and fun, and let Sky Zone take care of everything while you jump and enjoy time together. A family of four will receive 90 minutes of jump time each, one large – one topping pizza and a pitcher of soda all for just $60. 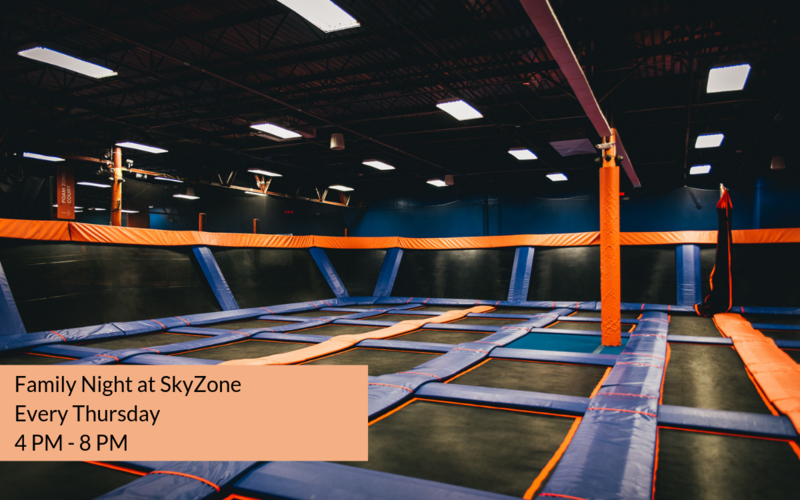 What is the Sky Zone? Sky Zone is the world’s first indoor trampoline park. They’re the inventors of “fun fitness” and the makers of trampolines as far as the eye can see. They’ve been voted the number one “out of the box” workout and the “best party ever.” Experience WOW – the weightlessness of bouncing, flipping and landing in a pit filled with 10,000 foam cubes.